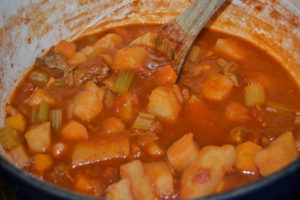 This week’s blog post, Sowing Seeds in Winter, left me wanting Nan’s hearty soup. 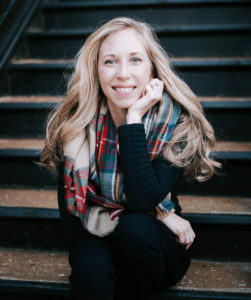 She always said she liked cool, cloudy days… that it was God’s way of telling us and the animals to slow down, and that those days paired perfectly with homemade soup. Some people are really good at slowing down and being mindfully still. I, on the other hand, need the reminder that it’s okay to not always be “doing.” Even the busy bees slow down on such days. So, as your soup gently simmers and the warm, delicious smells fill your home, I hope you take a moment for mindful stillness. Call it an amateur blogger mistake, but I prefer to say that I just have faith in my readers. I didn’t take a photo of the simmering stew beef, but you get the idea. Let me just briefly describe the process: Place beef into a large pot. I used my enameled cast iron pot, but a stock pot would work just as well. Pour water over beef until it covers it by 1″. Add in salt, pepper, and garlic. While beef simmers, prepare veggies. Some people like corn or cabbage in their veggie soup, but I like to make mine how Nan used to. Of course, she varied hers according to what was in the pantry, but onions, carrots, celery, and potatoes were always in the soup. Remember to chop everything to a similar size (and consider spoon-size) for even-cooking. Remove meat and set aside. Retain about 2 cups of beef broth. Mix all veggies and spices into large stock pot. 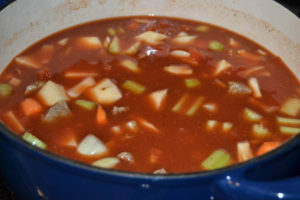 Add the V-8, can of drained/diced tomatoes, and 1.5-2 cups of beef stock until ingredients are well covered. Stir. Bring to a boil, reduce heat to a low-medium and simmer for 1-1.5 hours. It’ll be just as delicious reheated tomorrow if you need to make ahead! Stay warm and stay well, folks! 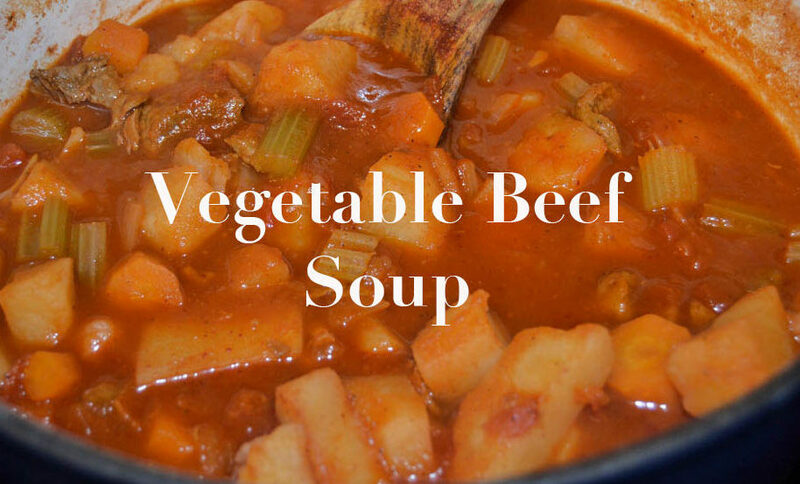 Place stew beef in a large stock pot or enameled cast-iron dutch oven. Cover generously with water. Add in salt, pepper, and minced garlic. Bring to a boil and then reduce to a low-medium heat, cover partially and simmer for approximately 30 minutes. While meat is cooking, chop veggies. 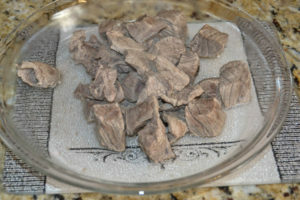 Remove meat from pot, retain only 2 cups of beef broth. Add meat back to a clean pot, along with veggies, garlic powder, pepper (no need for more salt–there’s plenty in the V8), and can of diced tomatoes. 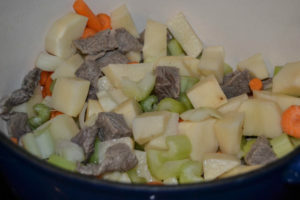 Cover with V8 Juice and 1.5-2 C of the retained beef broth. 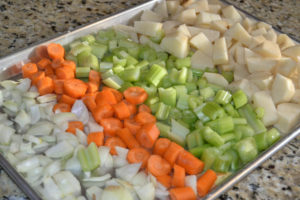 Bring soup to a boil, reduce heat (to low-medium) and simmer approximately 1.5-2 hours or until soup’s contents has reached desired tenderness. May be reheated the next day. Enjoy!